Amatrol’s Reduced Voltage Starting Learning System (85-MT5-B) adds to the Electric Motor Control (85-MT5) to teach methods of starting electric motors under reduced voltage, 3-phase power distribution using Delta and Wye transformer wiring configurations, and troubleshooting. Reduced voltage starting is ideal for applications where full motor torque could tear or damage a product, such as paper or delicate fabric. Learners will study Wye-Delta power distribution, types of voltage circuits, and the operation of an autotransformer reduced voltage starter. Reduced voltage starting includes a Dual Transformer Station, featuring two control transformers, and a Power Resistor Station, featuring three 25 ohm, 100 watt resistors. This industrial motor control training system uses industrial quality components that stand up to frequent use and enables learners to practice with real-world components that they will encounter on the job. Reduced voltage starting includes two panels, the dual transformer station and the power resistor station. Each of these panels is made of 11-gauge steel for durability and easily integrates with the Electric Motor Control system (85-MT5). Learners use these panels to study the operation, installation, performance analysis, and design of components used for reduced voltage motor starting. The power resistor station includes three (3) 25 ohm, 100-watt power resistors. The dual transformer station features two (2) control transformers (250 VA minimum), multiple tap primary (208, 277, 380 VAC), and a single tap secondary (120 VAC). Troubleshooting is a vital industry skill that will help learners understand malfunctions in normal operation and give them the skills to correct faults as they arise. Reduced voltage starting allows learners to practice troubleshooting skills for reduced voltage motor starting, such as primary resistor motor starter faults, autotransformer reduced voltage motor starter faults, and part winding motor starter faults. 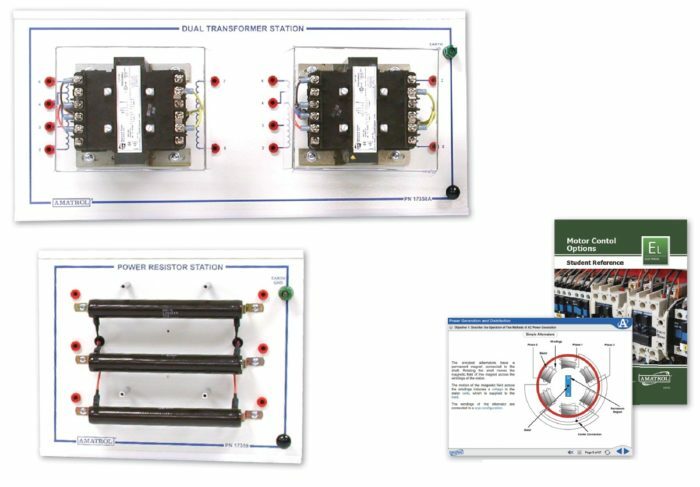 This training system’s curriculum allows learners to apply strong theoretical knowledge directly to hands-on skills, such as using a multimeter to determine whether a distribution system is a Wye or Delta configuration and designing a Delta-to-Wye bank configuration using three single-phase transformers. Major topic areas include different types of motor starters, AC power generation, and transformers in power distribution. A sample copy of this course’s Student Reference Guide is included with the learning system. Sourced from the multimedia curriculum, the Student Reference Guide takes the entire reduced voltage motor starting course’s technical content contained in the learning objectives and combines them into one perfect-bound book. If you would like to inquire about purchasing additional Student Reference Guides for your program, contact your local Amatrol Representative for more information.